The University of Chicago Press recently published Shakespeare and the Law: A Conversation among Disciplines and Professions, edited by Bradin Cormack, Professor in English Language and Literature, Richard Strier, the Frank L. Sulzberger Distinguished Service Professor in English Language and Literature, and Martha C. Nussbaum, the Ernst Freund Distinguished Service Professor of Law and Ethics. 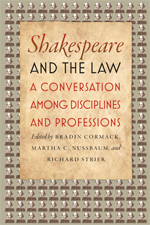 The book’s four sections examine the relationship between law and literature, Shakespeare’s awareness of the law, his attitude toward law, and how law enters into politics and community both in the plays and in our world. It closes with a transcript of a 2009 conference that inspired the collection, wherein Supreme Court Justice Stephen Breyer, Judge Richard Posner, Nussbaum, and Strier discuss the legal themes in Hamlet, Measure for Measure, and As You Like It. To read excerpts from the conference and learn more about Shakespeare and the Law, visit The University of Chicago Magazine. Posted in Uncategorized. Tagged with Faculty, Publications.